On the morning of 8 February, Harry Redknapp travelled to Southwark Crown Court to hear the final verdict on his tax evasion case. 24 hours later, the Tottenham manager had been found not guilty of the two charges of cheating the public revenue, and was the favourite to replace Fabio Capello as England manager after the Italian resigned the previous evening. The 64-year-old was on a high, personally and professionally, as he closed in on what he called "the ultimate job for an Englishman". Four months later, and Redknapp had been overlooked by England and now sacked by Tottenham. Another birthday has passed, and he is now past retirement age. He wants another job in football, but will one of England's most experienced, respected and colourful managers find a position big enough? A proven developer of talent and a shrewd operator in the transfer market, Redknapp, who began his footballing career as player with his local side West Ham, has consistently produced teams who play an attractive, attacking brand of football. Always ready with a quip and an anecdote for journalists, the Londoner has become a popular figure thanks to his charm and affable manner. Redknapp is a man whose life is immersed in football. Son Jamie played for Liverpool and England, as well as under him at Bournemouth and Southampton, while his nephew is Chelsea and England midfielder Frank Lampard. His brother-in-law is the former West Ham assistant manager Frank Lampard Sr.
An hour after winning the 2008 FA Cup with Portsmouth, Redknapp admitted: "I don't know what I'd do without football. I have got no other interests in life." His managerial career got off to an inauspicious side in 1983. In his debut game in charge of Bournemouth, his first major appointment, his side suffered a 9-0 defeat at Lincoln. "On the way home, it was like my world had come to an end," Redknapp admitted. He was not down for too long. Bournemouth were second from bottom in the old third division when he took over but just four years later had won the title. Then came the car accident in Italy in 1990 that claimed the life of friend Brian Tiler and left Redknapp nursing a fractured skull, a broken nose, several cracked ribs and a gash to his left leg. The accident was so bad that ambulance services arriving at the scene thought Redknapp was dead and placed a blanket over his head. After his enforced break from football, Redknapp returned to the game at West Ham, becoming assistant manager in 1992. He was handed the manager's role two years later, succeeding Billy Bonds. The highlight of Redknapp's reign at Upton Park, which ended in 2001, was a brilliant fifth-placed finish in the Premier League 1999, earning the club a place in Europe. Redknapp was credited for nurturing a wealth of young stars while he was at West Ham, with Lampard, Rio Ferdinand, Joe Cole, Michael Carrick and Jermain Defoe all going on to represent England. Redknapp also displayed his people skills by producing some scintillating displays from Italian Paolo Di Canio, considered a maverick character who was tricky to control. Redknapp's departure from West Ham in 2001 was caused by a rift with chairman Terence Brown, not the first time he would leave a club in acrimonious circumstances. But he was quickly back in football, becoming Portsmouth's director of football that summer and then manager the following year. Bournemouth: Football League Trophy: 1983-84. Football League Division Three: 1986-87. West Ham: UEFA Intertoto Cup: 1999. Portsmouth: Football League Division One: 2002-03. FA Cup: 2007-08. Tottenham: League Cup runners-up: 2008-09. Champions League quarter-finals: 2010-11. He ended Pompey's 15-year wait for top-flight football by leading them to promotion. The club then finished 13th the next season before another bitter split. By November 2004, Redknapp's relationship with chairman Milan Mandaric had broken down completely and he chose to resign. Redknapp's next destination could not have been more controversial, joining fierce local rivals Southampton. Saints were relegated from the Premier League on the final day of the season and Redknapp was back at Portsmouth by December 2005, admitting he had been wrong to leave. "I'm an emotional man at the best of times but I made a monumental mistake walking out of Fratton Park," he said. Redknapp was to enjoy greater success in his second stint at Portsmouth. He kept them up then took them to ninth and eighth-placed finishes, backed by the funds of the then owner, Alexandre Gaydamak. Redknapp then achieved hero status by winning the FA Cup in 2008, Portsmouth beating Cardiff 1-0 at Wembley. He admitted it was "a dream come true" but was soon on his way again, upsetting Pompey fans by leaving to join Tottenham in October of that year. The switch meant Redknapp had finally landed a job at one of the country's heavyweight clubs, giving him the chance to work with top-level players. Spurs were bottom when he took over but finished eighth that season. He then guided them to fourth the following campaign, ensuring the club qualified for the Champions League for the first time in their history. Tottenham subsequently reached the quarter-finals in Europe's elite competition, recording some famous wins over some of the continent's most prestigious clubs. They also performed well in the league, finishing fifth. The north London club were enjoying another promising campaign this time around, pushing the Manchester clubs in the title race, but speculation linking Redknapp with the England job coincided with a dip in form. Ten points clear of their north London rivals Arsenal in February, they went on a dismal run of one win in nine games, and ended up one point behind the Gunners in fourth, missing out on a Champions League place when Chelsea won the competition. By then, Redknapp had been pipped to the England job by Roy Hodgson and reports began to circulate of a rift between the manager and Spurs chairman Daniel Levy. Redknapp spoke openly of his desire to secure a long-term contract before next season, but with Levy seemingly unwilling to commit, an impasse ensued, culminating in confirmation of Redknapp's departure from the club on 13 June. And so, while Hodgson's men compete at Euro 2012, the man who most people expected to be leading England finds himself out of a job. Midway through last season, he underwent minor heart surgery but was soon back at his job, summarising the zest for life and for football. "I always said they will probably end up taking Sir Alex Ferguson out of Old Trafford in a box and I'll probably be exactly the same," he said. "It will take more than a minor heart scare to ­convince me to walk away from the game. The only other way I'll walk away from football is the day I stop enjoying it - and that isn't going to happen any day soon." 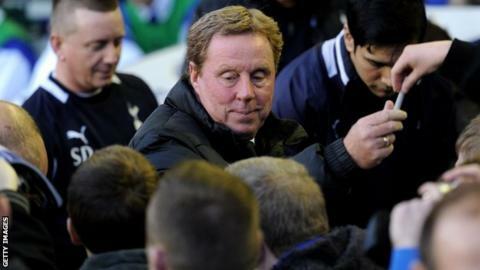 Redknapp reacted quickly to suggestions after his sacking from Tottenham that he would retire from the game, insisting that he was "fit as a fiddle". Although he has only won five trophies in his 29-year career, other clubs are likely to covet his experience and his man-management skills. But Redknapp has traditionally thrived at clubs where he has been backed by generous transfer funds, and he has stated that he would never leave his luxury home on the South Coast. Many clubs will want Redknapp, but he now has a taste for the Champions League after his three and a half years at White Hart Lane. There may not be too many clubs who can offer him the return to the top table he craves.